For over a decade we knew him as bar owner Sam Malone in the hit TV series "Cheers". Thirty years on, he's still gracing our small screens and is now known as the womanizing party-goer George in the HBO series "Bored To Death". 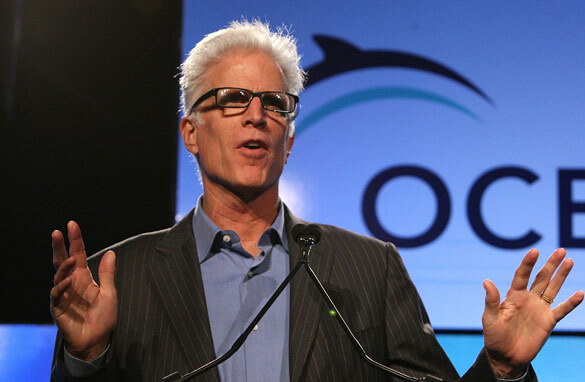 As a multiple Emmy and Golden Globe winning actor, Ted Danson has long been making us laugh and cry, but he's also been urging us to save our oceans. Danson was propelled into becoming an environmentalist in the 1980’s after coming across a “water polluted, no swimming” sign with his children on a Santa Monica beach. He decided to try and turn the tide and co-founded what has now become the world’s largest international ocean conservation and advocacy organization, Oceana. The 63- year- old has now documented the threats to our oceans in a new book “Oceana: Our Endangered Oceans and What We Can Do To Save Them”. He's your chance to have your questions answered by actor and activist Ted Danson. Are any particular oceans worse off than others? Pacific vs Atlantic, Indian, etc? what do you think is the greatest threat to our oceans? here's a good question that is more personal. what is your favorite spot in the world where you like to admire the beauty of the ocean? somewhere on the california coast? on a tropical island? What was with Danson slamming the Dems? He claimed that the Dems have 'done nothing in two years' – or some such nonsense. and on and on... oh, yea – Affordable Healthcare for Americans. Hello. Dansen needs to wake up. He thinks that he is an environmentalist because his beach was polluted, and comes up with a book? He probably has a house in Malibu with his own private beach. I work with people who have the same concerns about our environment, particularly our oceans. They have ideas, have launched programs, even developed products that can help... yet they all struggle to gain acceptance, awareness and ultimately, commercial notice of what their potential solutions could accomplish. Is there frustration in the conservation and advocacy scene over stalled momentum for those who are trying to act? How can entrepreneurs and and others who are dedicating their efforts to helping clean up our environment get noticed by entities who can help them put their ideas to work? Apparently there are massive floating fields of debris in the oceans. Why do we hear so little about this pollution and why is nothing done to get rid of this filth? Could old fishing boats be used? Who did you like more, Diane or Rebecca? Are you in the new series of Curb? What do you feel is the most important US ocean legislation we can urge our representatives to support? I think it's great that he's doing this, but, so are a lot of other groups. My question is: how can we coordinate the efforts of the different agencies and organisations. I belong to a number of "save the ocean" type groups and I can't help but noticing that they're all trying to do the same thing, relatively independently of each other. Couldn't we be more effective if we collaborated. I understand that every organisation has their own focus and key areas, but aren't we all talking about the same oceans? What is Oceana doing on this front? Do you see the commercial exploitation of krill in the Southern ocean as a potential problem for the Antarctic ecosystem? Do you see the commercial exploitation of krill as a threat to the Antarctic ecosystem? –	How will you as co-founded of Oceana Improve our World Resistance Against The Pacific Ocean Ring of Fire, which is an Area where Large Numbers of Earthquakes and Volcanic Eruptions Occur in the Basin of the Pacific Ocean? I am awaiting Ted Danson’s replies.